I'm trying to set up a photo shoot on Saturday, April 5th. I'm hoping to get two bikes for this shoot. Mind you, the shoot is most likely going to be early. Probably starting at 6:30 AM or so. Yes...sunrise or a bit after. That's when the best outside lighting is available. I haven't figured out the exact location as of yet. I'm thinking maybe it'll be down near Boulder City, but not positive yet. I have to check out a couple of locations this weekend first. If you're interested, please post up here and/or send me a link or pic of your bike. I can't have one where half the plastics are ripped off or something. I'm sure you understand. However, if there are certain scratches or what not, please advise and I'll see what I can do. If they are easy for me to clone out, I might use your bike. Anyway, please let me know so I can set all this up. Oh, and I normally do take some shots of just the bike and you will get a CD of those shots. Can't really release the model shots to you because she'll be under a modeling release/contract with me. I'm sure some will get posted here if all goes well. PS I have done some shoots with SCS member's bikes and ladies here before, so if you need references, I'd hope they would be happy to post up about the experiences. I'd love to see my ST1300 in some photos but thats just way too early for me. I'd have to find an alarm clock. is this open to any one or just club members? here is a thread with my bike. Don't know if your looking for sportbikes specifically, but I'm willing and my bike is without scratches, great condition!! Joe - I appreciate the post up bro. I definitely loved shooting with your bike last time. Would need an alarm clock, eh Will? I'm sure when things get going again, I'll have some afternoon shoots for you to participate in. Rush - No, it's not limited to SCS members. Although I do like to shoot the members bikes because I was one before (and lobbying to become part of the club again, actually), but I'm not limiting it just to SCS bikes. However, how clean is your bike? My shots generally show EVERYTHING on the bike...so if it's dirty, I won't be able to use the shots. However, if it is clean, yours is a possibility. Mr. Brown - Got your PM and will call you tomorrow. No, I'm not limiting my shoots to just sport bikes. Actually, it's kind of funny because I need some "other" bike shoots as well. It's just usually that most people with sport bikes pipe up. LOL I'll call ya tomorrow about this, but from looking at the photos, your bike is in. Thanks to everyone that's posted so far. I appreciate it! Got an '00 ZX-9R in immaculate condition. Ask anyone who's seen it. The one that's on your avatar? 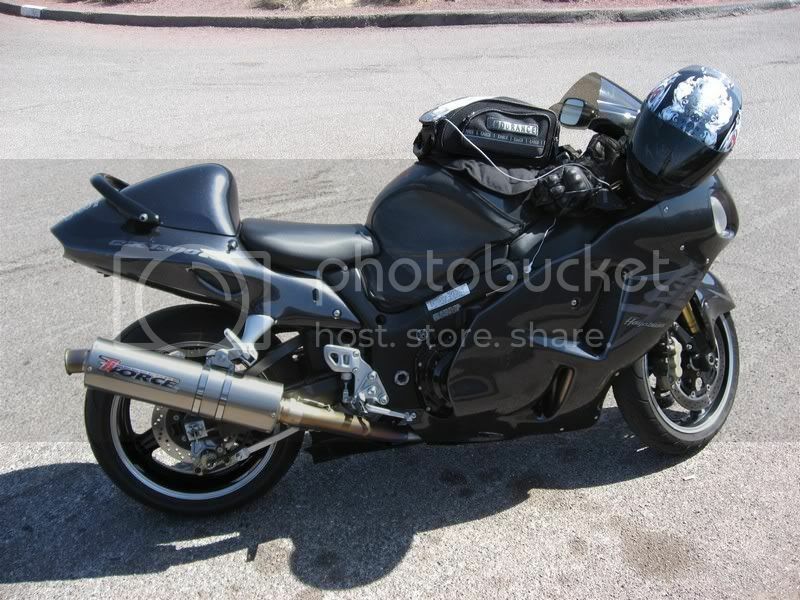 At some point, I definitely would like to shoot the mighty Busa! Maybe I'll save that for an afternoon shoot and I could get yours and Will's bike together for an afternoon shoot. We'll have to see how this next weekend shoot goes first. I'm just worried about being way rusty after taking so long off from shooting. I don't want to embarrass myself TOO bad.